New Delhi: The ruling National Democratic Alliance (NDA) on Thursday defended the high-value currency ban announced this day two years ago, even as the Congress warned the government not to resort to “further unorthodox, short-term economic measures". The opposition party’s warning followed reports that the government may invoke the never-used section 7 of the Reserve Bank of India Act to issue directions to the central bank. Media reports also suggest the government is seeking a transfer of ₹ 3.6 trillion—more than a third of the reserves of the central bank—to itself. It also comes against the backdrop of a growing perception among critics that demonetization caused a lot of distress without achieving much. Finance minister Arun Jaitley countered an attack by a host of Congress party leaders led by former prime minister Manmohan Singh, saying that demonetization made tax evasion harder. The total number of income tax filers when the Modi administration assumed office in 2014 were 38 million. The taxpayer, the minister said, had to pay not only his taxes, but in order to run the system of governance, also pay the share of the evaders. “Hence there was a need to formalize the Indian economy," Jaitley said in an interview to national broadcaster Doordarshan. In FY18, 68.6 million income tax returns were filed. 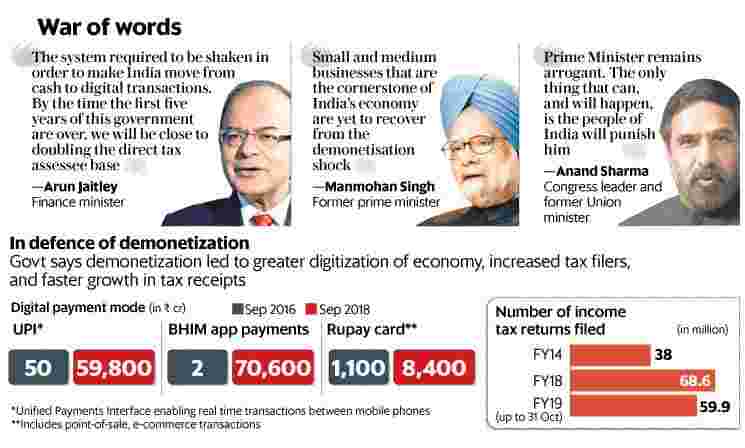 Manmohan Singh said on Thursday that the havoc that “the ill-fated and ill-thought demonetization" had unleashed on the Indian economy and society is now evident to everyone. “Notebandi (currency ban) impacted every single person, regardless of age, gender, religion, occupation or creed," he said. There has not only been a steep drop in economic growth rate, Singh said, but the deeper ramifications of the currency ban are still unraveling and small and medium businesses that are the cornerstone of India’s economy are yet to recover from the shock. “It is, therefore, prudent to not resort to further unorthodox, short-term economic measures that can cause any more uncertainty in the economy and financial markets. I urge the government to restore certainty and visibility in economic policies," read Singh’s statement tweeted by the Congress. “Today is a day to remember how economic misadventures can roil the nation for a long time and understand that economic policymaking should be handled with thought and care," Singh said. He added that the economy continues to struggle to create enough jobs for the youth. Experts said it may be too early for the last word on demonetization’s outcomes. “Costs of demonetization are of short term and have been documented. The benefits, however, lie in the medium to long term. We have already seen some of the positive results such as a wider tax base and formalization of the economy," said N.R. Bhanumurthy, professor at the National Institute of Public Finance and Policy. Jaitley said in a Facebook post that demonetization was a key step in a chain of decisions taken to formalize the economy, which has added more direct and indirect taxpayers and made tax evasion harder. Digitization, financial inclusion and leak-proof direct transfer of state benefits to citizens are also part of the key measures taken, the post said. Jaitley said the currency ban led to cash holders depositing cash in banks, greater lending capacity for banks, more tax filers and higher tax receipts. Congress party leader Anand Sharma, however, attributed the addition in taxpayers to the Seventh Pay Commission award to government workers. Sharma asked if Prime Minister Narendra Modi was ready to apologize to the nation. Former finance minister and senior Congress party leader P. Chidambaram said that 99.3% of demonetized currency was officially exchanged at bank counters. “It was the most ingeniously designed official money laundering scheme," Chidambaram alleged in microblogging site Twitter.